The Insurance Appraisal Process - Dispute Resolution debate / advocate well and in a professional, courteous manner appraisal session. When you consider the number of contractual and legal issues that can arise in the appraisal session, it makes sense to utilize an appraiser who has extensive knowledge on the Insurance Act Section 128.
with a quick, cost-effective solution. If you ever need to make a home/auto/business insurance claim, it will be important to have a detailed list or inventory of all your household assets/possessions. Your up-to-date home inventory will help you get the best compensation for your insurance claim. You file an insurance claim following a fire; flood or break-in at your home, but the dollar value of your claim comes under dispute. You think it’s worth more than the insurance adjuster thinks it’s worth less. You are now at an impasse, so the time has come to enquire about your legal rights. Instead of a costly battle in court, take a look at what you are legally entitled to in your insurance policy. Did you know that an appraisal clause is written into every insurance policy sold in Ontario? 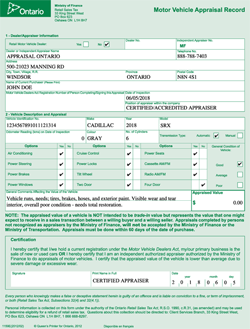 An appraisal is an alternative dispute resolution process that is incorporated in ALL Insurance policies. An appraisal is made by a qualified expert who provides you with an unbiased professional opinion of your property’s estimated value. If you’re interested in the appraisal process, the first step is to make a formal request. According to the Financial Services Commission of Ontario FSCO), the agency responsible for regulating insurance in the province, you have a right to an appraisal once you specifically demand it in writing, but it must come from you, the policyholder. Once you receive your insurance company’s authorization, you can hire an expert at your own expense to perform a second appraisal. 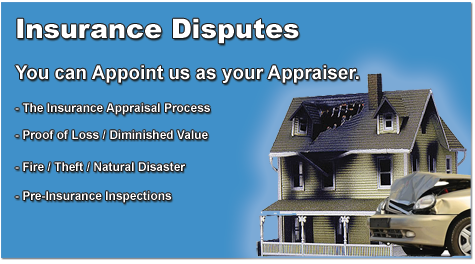 Your appraiser and the insurance company’s appraiser will then meet to try and reach a decision. If they cannot agree on the value of your claim, an umpire is called in, and the umpire costs are split between you and the insurer. The umpire will review both appraisals and determine a fair price for your insurance claim. Since this is a quasi-judicial process, the umpire’s decision is binding and you cannot appeal the decision in court later on. Resolving a Dispute between you and your Insurance Company - your rights. Having little or no knowledge about the car appraisal process before filing an insurance claim? The main objective of a car appraisal is to help determine a fair value for your car after an accident. This is usually done to help your insurer know how much it would cost to fix your car after an accident. In some cases, the cost of the repair may be higher than the current worth of your vehicle. In such a case, the insurance company will pay you the worth of your vehicle as determined by the appraisal – thus ‘totaling’ your vehicle. The first step to take after an accident is to report the accident to your insurer. Lately, many insurance companies have claim adjusters who are easily dispatched to the accident scene to appraise the vehicle. First, the appraisal expert would ask you a series of questions to determine the cause of the accident before proceeding to take a look at the vehicle. Generally, when a car appraisal is initiated, the appraiser is trying to determine the extent of damage from the accident. This is just a standard procedure put in place by insurance companies to determine how much the coverage will cost. This is necessary because the coverage you’ll receive from your insurer is relative to this estimate. The extent of damage to your vehicle after an accident could be so severe that the money to fix it may be more than its worth. In such a scenario, the appraiser may write the car off as a total loss. The smart thing to do in such a situation is to accept payment for the worth of the car instead of trying to fix the car yourself. 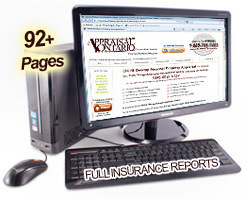 Your insurer is under obligation by law to offer you a fair price. Again, being present during the process of appraisal would help you negotiate a fair price for your vehicle. Hence, if you feel the worth of your car is far greater than what you’re being offered, you can easily tell the appraisal agent recent improvements you have done to enhance your vehicle. You’ll then have to provide receipts to that effect. * SPECIAL! No money Down, we will conduct a full insurance replacement appraisal and will handle the entire process for you.In most cases we can get you an additional 40% then what the insurance company will offer you. We get paid after you receive the Insurance payment from our experience; proven track record and hundreds of satisfied clients. It has been our experience that over 98% of the Insurance proof of Loss Claims get settle without going thru the Umpire process. CALL NOW before you sign off on your insurance claim! The process of battling a auto - home - business Insurance company over the payment of a claim may not be a pleasant experience, especially when fighting a claim settlement that is too low. This is usually because insurance carriers have much more experience and resources at their disposal when dealing with claims compared to the client. However, if you apply the right steps you can successfully obtain what is rightfully yours from the insurance company. Prepare Yourself when it comes to car insurance settlements, you need to find out all you can about your policy and claim. Your car insurance company will offer you an initial settlement after making a claim, but before responding make sure you understand your policy. Find out what your car insurance claim is worth. Keep all the receipts and add up all the expenses and bills, then calculate all the costs that you have incurred as a result of the car accident; fire or even water damage. The total of this cost will help you determine if the offer you have received is too low or not. The next thing is to figure out your acceptable settlement range. This is an amount that you are willing to accept from the insurance company for the settlement of the claim. You should be prepared to reject any amount lower than your limit. Equally important is the need to know your rights and obtain a total loss appraisal before you start the appraisal process. In the event of disagreement as to the value of the property insured, the property saved or the amount of the loss, those questions shall be determined by appraisal as provided under the Insurance Act before there can be any recovery under this contract whether the right to recover on the contract is disputed or not, and independently of all other questions. There shall be no right to an appraisal until a specific demand therefore is made in writing and until after proof of loss has been delivered. (1) This section applies to a contract containing a condition, statutory or otherwise, providing for an appraisal to determine specified matters in the event of a disagreement between the insured and the insurer. (2) The insured and the insurer shall each appoint an appraiser, and the two appraisers so appointed shall appoint an umpire. (3) The appraisers shall determine the matters in disagreement and, if they fail to agree, they shall submit their differences to the umpire, and the finding in writing of any two determines the matters. If both Appraisers cannot reach an agreement or settlement after all their reasonable efforts to resolve issues in dispute, they both need to agree on a choice of an Umpire. In general, each side (Appraiser) proposes a short list of prospective Umpires and eventually they agree on one. If the two Appraisers fail to agree on an Umpire, then the matter is referred to a motion court judge, who hears evidence from each party and makes a decision on appointing an Umpire. Once the 'Appraisal Feature' is triggered, the policyholder (our client) and insurer (insurance company) are required to pay 100 per cent of their own Appraisers' costs. Also each party is required to pay 50 per cent of the total Umpire's costs. 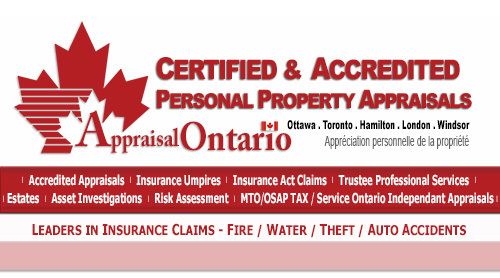 We at AppraisalOntario will communicate the costs in detail verbally and also with a written proposal before starting any 'Appraisal Feature'. How the 'Appraisal Feature' works - Top 7 points to know before starting this Process The Appraisal process under Section 128 of the Ontario Insurance Act starts with a request from either side to start the process. Only a simple letter outlining the concerns from the Client will start this process. It will include the Appraisal Report conducted by Appraisal Ontario and a demand statement to have the other side's Appraiser identified within 7 days of receiving the letter. 1) A insurance proof of loss form must be filed or provided to the insurance company before the appraisal process can be triggered. 2) Once both Appraisers have been appointed - moving forward they have FULL AUTHORITY of their respective clients to agree on the finial amount of loss, in accordance with the terms of the Insurance Act. 3) Most cases the first meeting of both Appraisers are done over a phone conference to review their point of view and to identify all issues and reason for the dispute held without prejudice. 4) There is usually a few phone conferences between the 2 Appraisers trying to resolve these issues of the dispute. This method is used to provide full disclosure and an understanding of their evidence and reasons for the dispute. 5) Both Appraiser has the FULL AUTHORITY to bind their clients to a settlement. There is a degree of negotiating between the 2 Appraisers at this time to help minimize unnecessary additional costs to their clients if not reasonably required to do so. 6) Only when both Appraisers cannot come to full agreement, or many times cannot agree to a few issues, then the next step is involving an Umpire to settle these issues. 7) It is important to note that it only takes 2 of the 3 parties involved in the Umpire process to sign a final order. Either Appraiser with the Umpire or hopefully all 3 will sign the finial order. We are Professionals, we are not influenced in any way,other than to make sure that the belongings get the highest amount possible.